I came up with this recipe because I had planned on my friend and I having lunch but she brought her mother as well. An extra person usually isn’t a big deal but I only bought a pound of salmon and was worried that there wouldn’t be enough food. 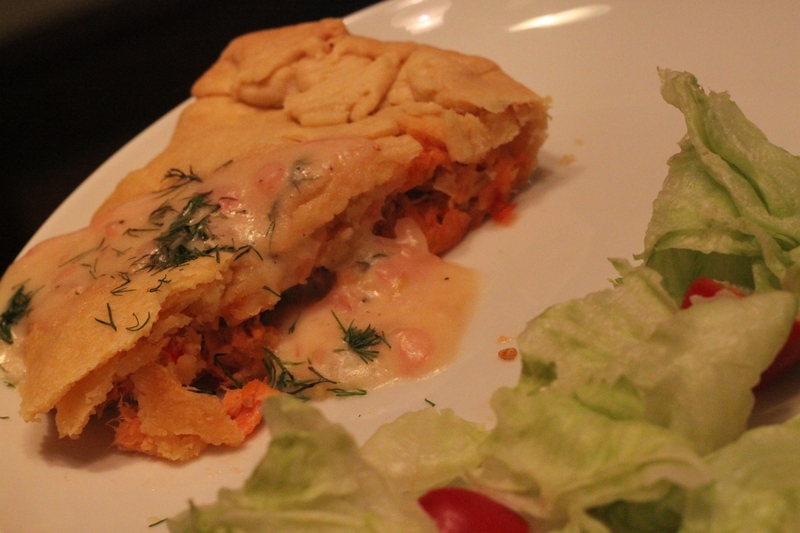 So I added some veggies to my salmon and put it in a pie crust. Lemon-Dill Sauce: I’ve had this recipe since the 90’s and CANNOT remember where I found it but I love it! I baked the salmon at 375 degrees (190C) for 25-300 minutes. Flake your baked salmon into a medium sized bowl. In a separate bowl, combine the mustard and mayonnaise and mix into your salmon. Add your vegetables and mix well. Boil wine, shallot and lemon juice in medium saucepan over high heat until reduced to 1/4 cup, about 6 minutes. Reduce heat to low; add butter, 1 piece at a time, whisking until melted before adding more. Remove pan from heat. Stir in dill. Season to taste with salt and pepper. The mayonnaise and pie crust makes this a rich dish. I would be generous with the sauce per serving because the lemon and wine help balance all of the flavors. As you can see, I served this with a side of dressed greens which also helps.